It happens every year. No matter how good a year may have been, we have to make resolutions for a better new year. At least that’s how I roll, since I crashed my motorcycle a total of six times in 2015 (seven crashes if you include a bicycle wreck into a creek full of big rocks). So let me make a New Year’s resolution for myself and the wider motoring community, to crash less in 2016. If you can’t commit to making better decisions, you are going to need to supplement good decisions by buying the right protective gear. That protection will come in the form of some updated gloves from REV’IT. The REV’IT Monster 2 and Chevron 2 gloves pack some already great features carried over from their predecessors and some new tech that will keep your mitts safe and comfy. If you were a fan of the old REV’IT Monster gloves, they are now the REV’IT Bomber Gloves. If you love progress, and by progress I mean adding technology to things while making them look older, than the REV’IT Monster 2 Gloves will satisfy. The newly revised REV’IT Monster 2 Gloves contain all of the original Monster’s bad to the bone appeal, while bringing in some killer retro styling and intensifying the protection. You get some cool new features including a tech finger and thumb, a sleeker looking hard knuckle protector, and retro quilting from the race inspired accordion stretch panels all the way over the cuff of your wrist. But REV’IT Monster 2 is not just a stanced out hipster love glove; it packs functional safety into the beautiful new frame. The outseam has been reinforced, you get larger reinforcement leather panels over the palm slider and grip, and the REV’IT logo has been geniusly relocated over the ulna to provide additional protection and style. The REV’IT Monster 2 Gloves are a great choice at only $129 if you are looking for a retro styled glove that takes in all the new-school tech for your cafe racer or bobber bike. For the lady riders, the REV'IT! Women's Monster 2 Gloves are also available. 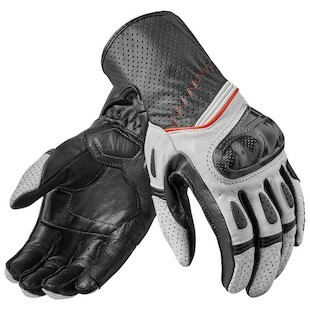 The street bike crowd gets some special treatment with the modernized REV’IT Chevron 2 Gloves. The same externally stitched glove digits pleasure your fingers so that you can unburden yourself from the distraction associated with threads biting into your skin. 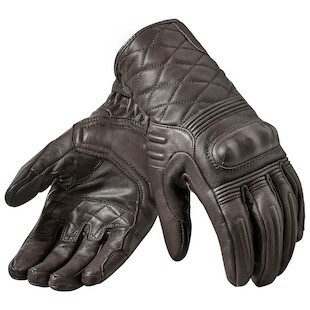 With fully perforated panels at the fingers and cuff as well as accordion stretch panels on the fingers and above the wrist, you will have some excellent ventilation and comfortable fitting gloves for summer riding. The palm slider is now a hard dual compound piece to prevent tumbling and resultant breaking of bones and the REV’IT logo has been transformed into ulna protection. The TPU sliders on the back of the fingers have been removed, but in all honestly they wouldn’t be needed except you find yourself crashing as often as I do. At only $119, the REV’IT Chevron 2 Gloves have added additional functionality required for street riding while retaining the understated beauty of carbon fiber on a stylistically simple glove. As with the Monster 2 gloves, a ladies specific option is also available with the REV'IT! Women's Chevron 2 Gloves. So there you have it. Two summer glove resolutions for 2016 to pick from. REV’IT is a style powerhouse, pumping out beautiful pieces of gear that function as well as they appeal to the eye. The REV’IT Monster 2 Gloves are for the cafe racer and bobber crowd, looking to maintain their retro style but unwilling to compromise safety. The REV’IT Chevron 2 Gloves would be happy being your only glove for sunny warm weather use if understated Italian beauty is more your speed.